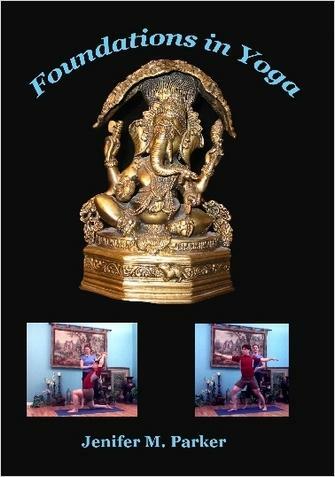 Holy Embers of Dreams: Yoga Video: I Was Robbed! Jenifer's yoga video has now entered the Long Tail. She and her one-man film crew Derek DiGiacomo worked hard to bring you an instructional video that departs from the "aerobics model" usually adopted by yoga videos. They called it “Foundations in Yoga,” but I thought a better title would be “Ryan Rasmussen’s Yoga for Superheroes.” See that guy in the tight red supersuit? * Yep, that's me. The Talent. Sure, you might want to know that the video illustrates yoga practices such as mantra, intention, pranayama, asana, meditation, and prayer. Or that Jenifer really knows her stuff and has studied with folks like Sri Dharma Mittra, Beryl Bender Birch, and Shiva Rae. But we all know what you're really after. And I don't blame you. I'm not a one-tusked cookie gobbler like Lord Ganesh. Look at him, trying to steal my thunder. In gold, no less. Talk about gaudy. Ah, well. If you can look past all these grievances, you'll find the video available here. Thank you for your support. I'll be buying mine tonight! Please extend my congrats to Jenifer on the release. Always the early adopter! The true mark of a superhero. I will certainly pass it on! What is this yo-ga you speak of? I think I should like to try it, see what the young people are up to. I don't have all the details yet, but I understand it can help with mojo leakage. I bought one for Xmas and it arrived today. I haven't watched it yet, since I wrapped it so no prying eyes could find it. So, it will be a few weeks until I watch this masterpiece. It's great. Jenifer is a sublime teacher with one of the best "ohms" you will ever hear.